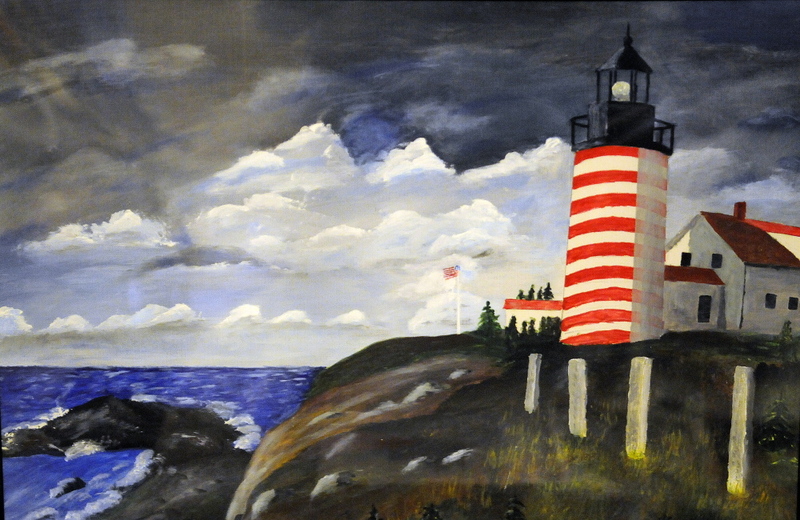 Ernie and Polly DeRaps have produced paintings and a book to celebrate Maine's heritage of 65 once-staffed lighthouses. RICHMOND — When Ernie and Polly DeRaps came ashore in 1962 after keeping the lights burning at four Maine lighthouses over a seven-year period, they had such good memories of their experience in the U.S. Coast Guard, they wrote a book about it. 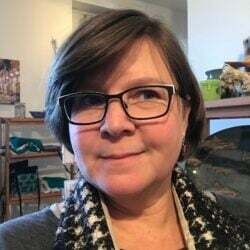 His story was called “Lighthouse Keeping” and hers was titled “Light Housekeeping.” The first edition in 2006 by FogHorn Publishing of East Machias sold out, and Ernie donated one book to every high school library in Maine from the second edition, published in 2013. But DeRaps figured he still hadn’t done enough to commemorate the story of Maine lighthouses. 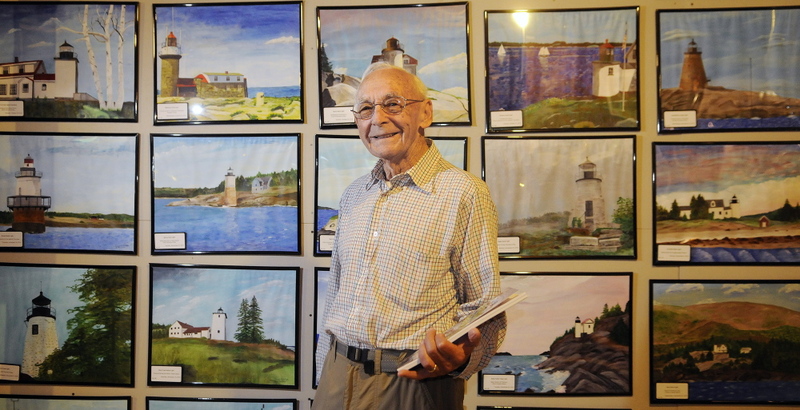 So after he learned to paint with acrylics when he turned 80 six years ago, he set out to paint a portrait of each of Maine’s 65 once-staffed lighthouses. He finished the series in 2012. The Coast Guard in recent years has been selling the old lighthouses, some of which date to the 1700s, to private owners, but the Coast Guard continues to maintain the automated light towers. In August, the tallest lighthouse in New England — Boon Island Light Station on an island off the Maine coast — sold for $78,000. In DeRaps studio in Richmond, each Maine lighthouse that at one time or another had a keeper is memorialized in colorful 16-by-20 inch paintings. The DeRaps family lived at three “family” light stations in Penobscot Bay, and Ernie served at one “stag” lighthouse for men only near the mouth of the bay. The family’s first assignment was at the Monhegan Island lighthouse from August 1956 to December 1957. Then they were at Fort Point Lighthouse in Stockton Springs from December 1957 to October 1959 and at Brown’s Head Lighthouse on Vinalhaven from July 1961 to November 1962. DeRaps manned the men-only Heron Neck Light Station on Green Island with two other lighthouse keepers from October 1959 to July 1961. His favorite assignment was at Fort Point Lighthouse because it was close to his wife’s family in Belfast, and the DeRaps family could attend St. Francis Church, where Ernie and Polly were married on Ernie’s birthday, Jan. 22, in 1951. They’ve been married 63 years and they have six children, 11 grandchildren and nine great-grandchildren. Ernie remembers taking part in two dramatic rescues. In one, a boat overturned south of Vinalhaven in heavy surf. A man was stranded on a half-tide rock, a rock that was exposed at low tide. The Brown’s Head Lighthouse’s 16-foot-boat was away for repairs so the only boat Ernie had at his disposal was a 10-foot punt. In another rescue in which several Coast Guard vessels took part, a 41-foot sailing yacht went aground in heavy fog in Lobster Cove on Monhegan. “They thought they were on a half-tide ledge, but when the fog lifted they saw they were aground on the island’s ledges,” Ernie said. The boat, which carried six people bound from New York City to Bar Harbor, was a total loss, but none of the crew were injured. DeRaps brought them back to the light station, where they had shelter for a couple of nights until the ferry from Port Clyde arrived on Monday morning. He said the Brown’s Head Lighthouse on the north shore of Vinalhaven was built closest to the water of the four lighthouses where he served. DeRaps said once a month the Coast Guard would send out a relief keeper, and the family could go to the mainland for a week or so. He said the isolation of the lighthouse keeper’s job was a negative factor. DeRaps was the youngest of 14 children and grew up in Palmyra. In February 1946, right after his 18th birthday, he joined the Navy for a two-year tour of duty. He served on the West Coast in San Diego. After his service was up, he returned to Maine and joined the Navy Reserve. He worked as a photographer for the Internal Revenue Service until President Dwight Eisenhower cut federal jobs in the mid-1950s and he lost his job. He joined the Coast Guard in October 1955 and served until July 1974. DeRaps worked for state government for 22 years, mostly for the Bureau of Parks and Recreation, and then finished out his working career by building super-insulated houses that had concrete and polystyrene walls with his son and son-in-law. The DeRaps share their comfortable home today with Big Ben the cat and Mary the Chihuahua. In order to paint his Maine lighthouse series, DeRaps took as many photos as he could of the lighthouses and worked from them. He asked friends to get photos of lighthouses that were not accessible to him. As soon as he sells one, he paints a replacement, so the set will be complete.